Carrots are a root vegetable. They are very versatile, and used in both sweet and savory cooking preparations. Both the greens and the roots of carrots are eatable. Carrots do not need to be peeled, but many people find the outer peel of a carrot to be bitter. 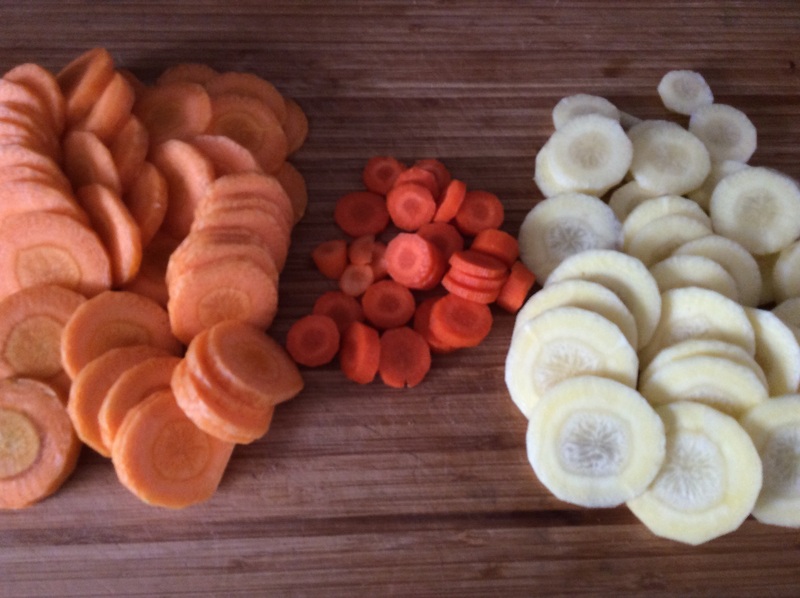 Carrots can be eaten raw, and they lend themselves well to many cooking methods. Carrot tops work well in carrot top pesto. 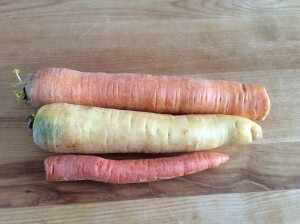 Carrots come in purple, red, white, yellow. Using rainbow carrots in a dish makes a stunning presentation. The colors will fade when cooked. For longer term winter storage, please see the root cellar options below. 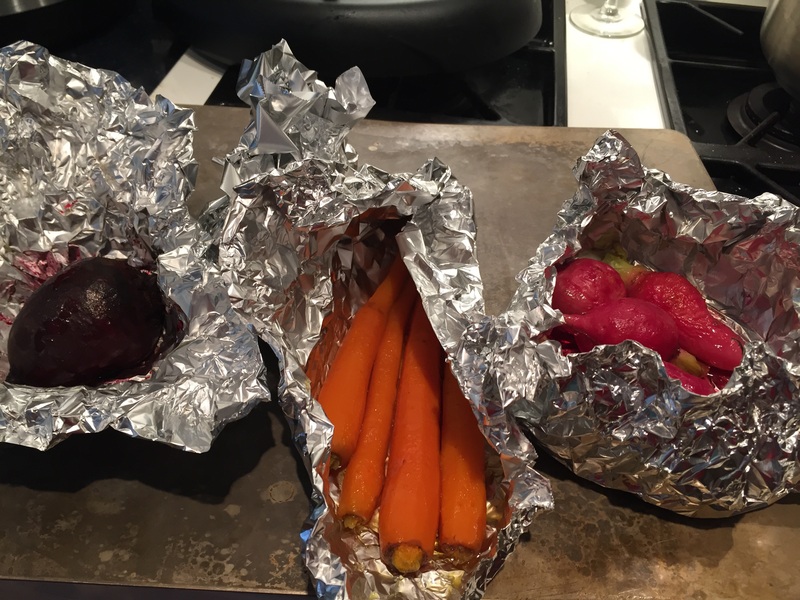 On pickup day, foil is Jess’ go-to method of cooking root veggies for use in recipes throughout the week. The beets here were drizzled in olive oil and kosher salt. The carrots were drizzled in Ben’s Maple Syrup and a pat of Amish roll butter. The radishes were honey roasted. This is what Jess has after roasting at 400 for a spell. The carrots and radishes were done faster. Don’t forget to save the radish tops to serve with the radishes! 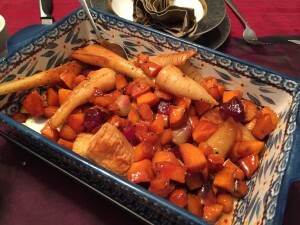 This was a quickie version of honey roasted radishes, but check out this version for the most delicious full Monty recipe. Hi! Jess here again to talk about longer-term carrot storage for a moment. There are many methods out there for storage, and what I’m talking about below is one approach that works for me, however feel free to explore what will work best for you, your households’ temperatures, humidities, lifestyles, etc. One method of storage is a root cellar. No, you do not need to build an addition on your house or go digging up your yard to have one (though you can if that’s how you roll). You may recall that last year I had 50 pounds of carrots stored throughout the season in a simple cardboard box setup, and the carrots lasted just about 6 months before we finished up the last of them- it was amazing! Here is a simple root cellar setup. 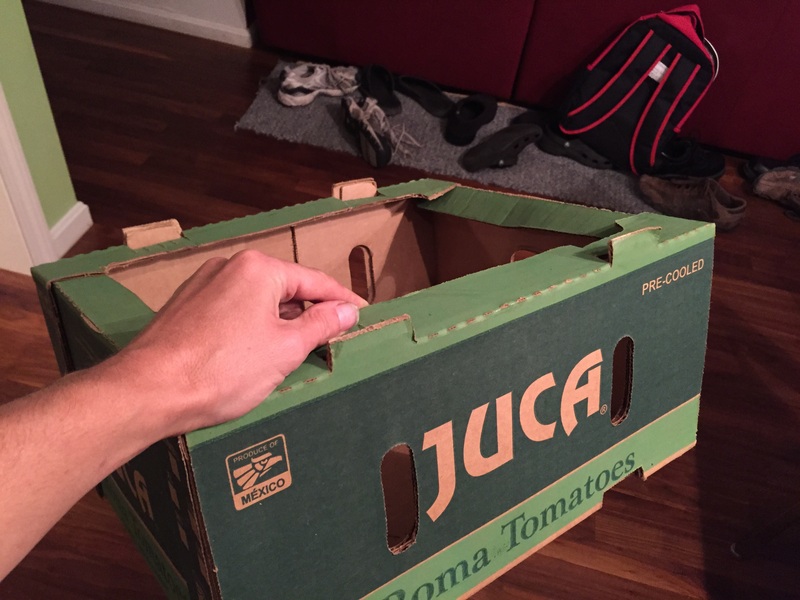 Obtain a sturdy cardboard or wooden box. Layer in your prepped root veggies. Veggies should be trimmed (of tops, but leave the “stubble at the top” or you can invite rot) and healthy (blemished veggies also invites rot). 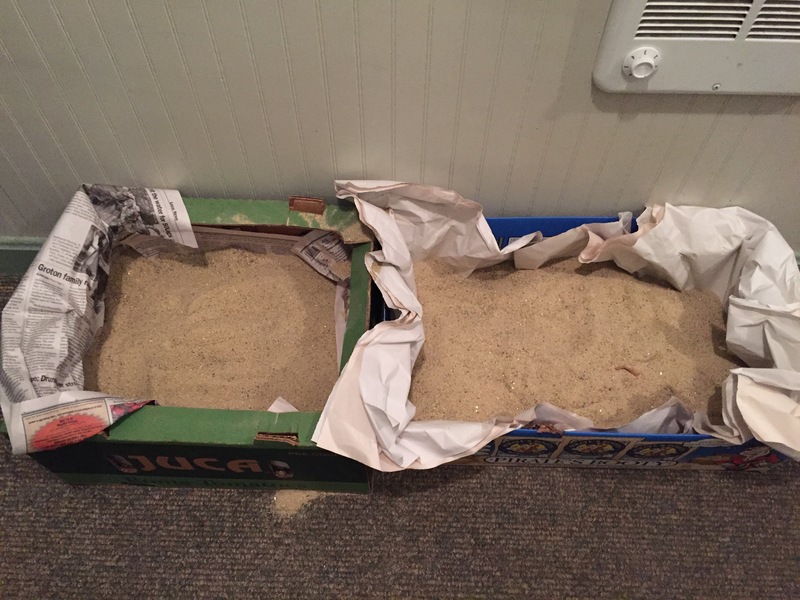 There is no need to pre-wash these, some dirt is a-ok. Next, cover them with sand (sawdust and potting soil also works- this year I’m using a 3 dollar bag of play sand) and repeat between layers. Store in a cool (not below freezing but not warm) place (in my house, this is a three season mini-room off in the garage). “Harvest” your veggies as desired. 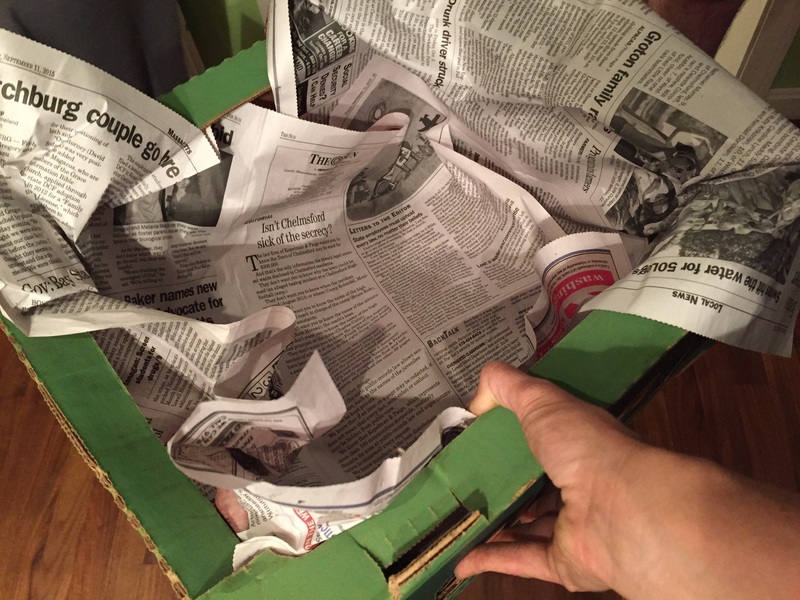 (Here I have a sandbox of beets and a box of carrots. In the cellar (my actual cellar, not the root cellar), I have my squashes stored in a crate. As the fall goes on, I’ll move into a second and possibly third crate. 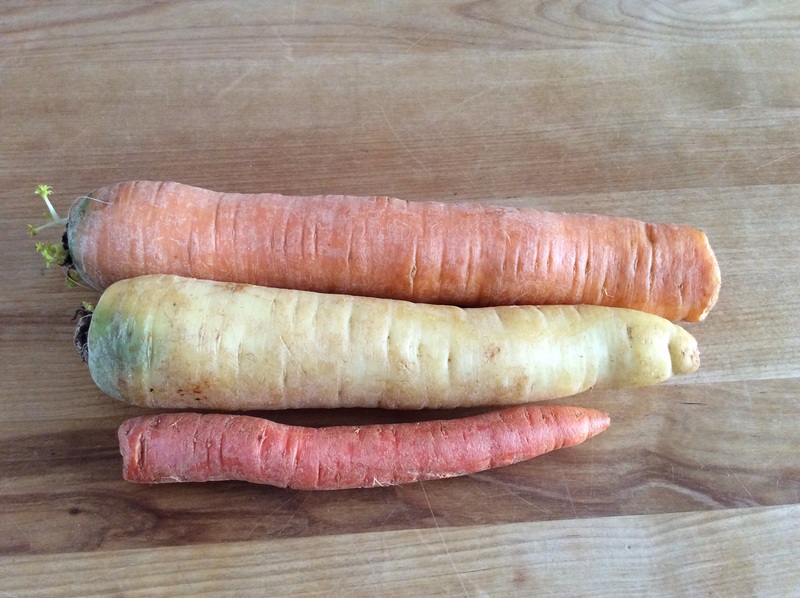 I’ve been reminiscing about these rainbow carrots from the share box a year or three ago – they made such great witches’ fingers! 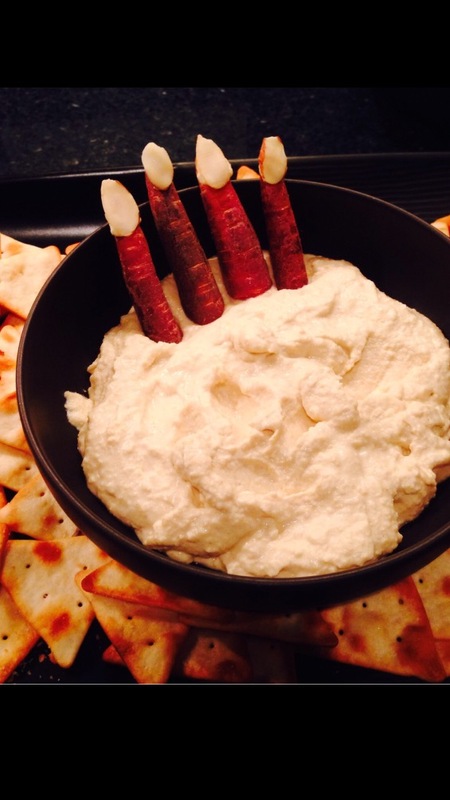 The fingernails were almond slices and the homemade hummus was so creamy. This one turned out wonderful, and it was so easy! Use pumpkin or squash puree, both get the job done quite nicely. I concede that slow cooking collard greens next to a piece of meat for hours is an amazingly delicious way to enjoy them, and totally worth the time involved. A side product is a soup base for other recipes, so it’s like preparing two meals in one! Kale, Chard, or Mustard greens (or any combo therein) can easily stand in for the collards. A sweet slaw to balance the spice in these Knockwurst, delicious! Lasagna is a great hearty meal made even better with fresh ingredients. The carrots in this one give it just a tiny bit of sweetness. 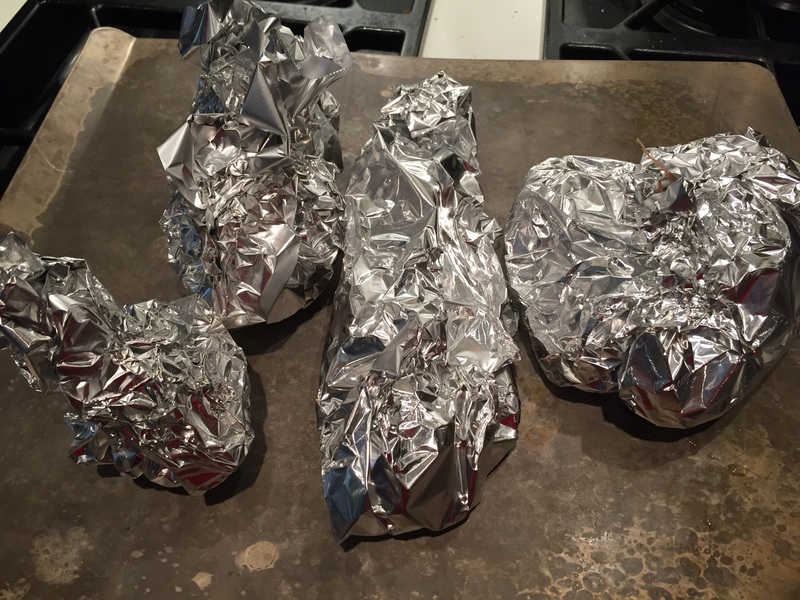 Pot roast is a great way to use chuck roast or another large lean cut. You can toss all the ingredients into a slow cooker and have something good, or you can take these extra steps and make it great. It’s a flexible recipe, just the way we like it! Potatoes can be added, different herbs and spices, make it your own! Lamb rib racks are great. They are inexpensive, and make a wonderful stock for other recipes. The stock is not gamey and is a great substitute for beef stock (even preferred to beef stock as it is so flavorful). This post talk you through making an easy slow cooker stock with lamb rib racks, with a link to an Irish lamb stew to make with it. This will take a good 6 hours to cook, so carve out an afternoon to prepare this dish. Fast to put together and tons of flavor. Mix and match any veggies you’d like with your beef and potatoes! Tested and approved by fellow Springdellian Holly F, this recipe differs from Gordon Ramsay’s just a bit, and includes the addition of corn and peas. If you have peas and corn in season or in your chest freezer, try this one! If not, perhaps go with Chef Ramsay’s. Either way, shepherd’s pie is a great way to enjoy your lamb!